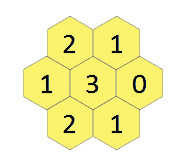 Above honeycomb structure contains numbers. A number at each cell represent a statement. x : This cell is surrounded by x True statements. Some statements are true and some are not. to show which statements are true, and which statements are false. there is only 1 solution. Find the solution ! This is a variation from a puzzle I posted yesterday. This puzzle is more simple, it designed to be solved without computer. Credit only for answers with explaination how to solve it without computer. Assume the "2" in the upper left corner is "T". That can't be from both the 3 and the 1 (either 1), the 1 touches 2+3 so the 1 would then be false. Ergo both 1's would have to be true and the 3 false. The 1's are already satisfied by the original 2, ergo the 0 and the other 2 are false, and the other 1 is true (because of the 3).... however this conflicts with the 2 in the bottom left. So the "2" in the upper left corner can NOT be "T", it must be "F". Now assume the "2" in the bottom left corner is "T". Again, you can't do that with both a 1 and 3, so both 1s must be True and the 3 False. The 3 must be false but it's already touching three Trues, the 0 must be False (because the True 1 gets that from the 2), so the Upper Right 1 must be True... but it's not touching anything True so it must also be False. So the "2" in the lower left corner can NOT be "T", it must be "F". Assume the leftmost "1" is False, both 2's are already False so the 3 must also be False. There are only three remaining cells, they can't all be False because of the 0, they can't all be True because that would make the 3 True, the 1's can't be True unless the Zero is True which is nonsense, so both 1's have to be False, which again means the Zero is touching nothing True but can't be True itself. So the leftmost "1" is True. And now find the rest. Which makes the "3" True. Which makes the "0" False. There are only two remaining cells so both 1's must be True because of the 3. Not the answer you're looking for? Browse other questions tagged logical-deduction liars no-computers or ask your own question.